Boastful, explosive, committed and controversial, Muhammad Ali is one of the greatest and most revered athletic figures in American history. His tale is not just one of athletic prowess. Ali’s story is one of commitment and dedication, humanitarianism, religious conviction, and standing up for one’s beliefs. His great traits also brought great detractors, especially in his early years, as he was pompous and vocal, frequently disparaging his opponents inside and out of the ring. Ali gave up boxing for his religious beliefs, refusing to fight in the Vietnam War, bringing about him banning from his sport and prosecution (which was later overturned). Once his court battle was finished Ali boxed again and again. Age and Parkinson’s may have caused his retirement from boxing but only deepened his religious faith and turned him toward charitable and humanitarian work. Muhammad Ali is a man who secured the release of American hostages from Iraq in 1990, carried the Olympic torch in Georgia in 1996, and was named a Messenger of Peace by the United Nations in 1998. To this day, America’s great sports legend travels more than 200 days per year for good causes and donates to charities. The comic celebrates his life beyond boxing and helps inspire readers to do more for themselves and others. 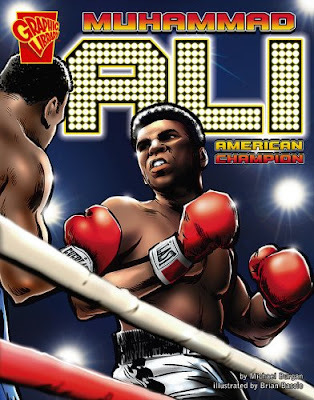 I suspect that most kids have heard of Muhammad Ali the amazing boxer, but I seriously doubt most students are familiar with his character and controversies. It is his efforts outside the ring that really make the man interesting and unforgettable. The man who never gave up is worth studying in the classroom. This comic would be a great story to use when studying a unit on heroes. Sure, we have mythological heroes, super heroes, but we also have real life heroes – those modern day persons who create good in the world. While kids would no doubt chose police officers, fire fighters, and military personnel, Muhammad Ali would be a great sports hero who has added so much great to the world beyond his athleticism. I recommend using the THIEVES method of reading nonfiction with MUHAMMAD ALI: AMERICAN CHAMPION. This method increases student understanding of the nonfiction texts by giving them lifelong reading strategies, which can also be utilized when trying to comprehend texts during standardized tests. Direct quotes from primary sources are depicted in a pale yellow (the references are published in the front of the book). The book also includes a table of contents, chapter headings, additional facts, a glossary with pronunciation guide, reading suggestions, a bibliography and an index.